We all know that North Texas is an amazing place to live and work, and there’s long been a friendly rivalry between whether Dallas or Ft. Worth is the better place to call home. 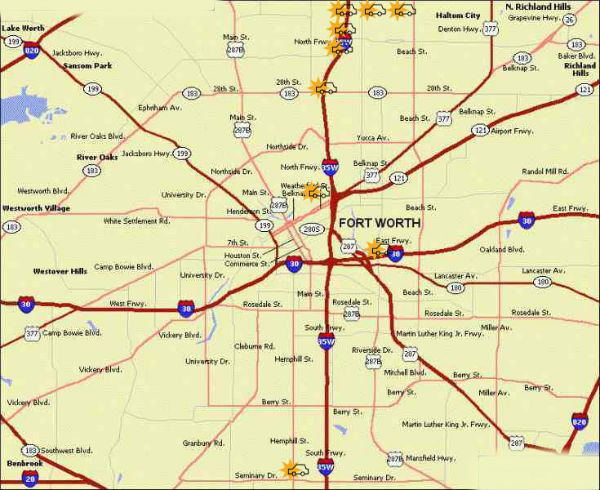 While each may have its pros and cons, there is no denying that the traffic congestion in Ft. Worth is much more manageable. That doesn’t mean, however, that the city isn’t immune to congestion and nothing grinds traffic to a halt faster than a car wreck. 10. I-30 & Beach St with 44 crashes. 9. I-35 & Pharr St with 45 crashes. 8. Beach St & Western Center Blvd with 47 crashes. 7. I-35 & Heritage Trace Pkwy with 49 crashes. 6. McCart Ave & Altamesa Blvd with 52 crashes. 5. Beach St & Tarrant Pkwy with 53 crashes. 4. I-35 & Basswood Blvd with 59 crashes. 3. I-35 & Meacham Blvd with 59 crashes. 2. I-35 & 28th St with 77 crashes. 1. I-35 & Western Center Blvd with 81 crashes. As you can see, I-35 and its on and off ramps are a particularly dangerous place to drive when it comes to the sheer number of accidents and one where all drivers should maintain heightened alertness. These accidents can be caused by a myriad of reasons, but a growing cause of accidents is simply due to distracted driving. It’s all too easy to get sucked in by the smartphone and respond to text messages or read emails, but even more shocking are individuals who are watching YouTube or Netflix while they are driving down the road. Even if you are a cautious and careful driver, it is important that you always practice defensive driving, especially when driving through any of these known problem areas. Despite best efforts on your part, there is still the chance that you may one day find yourself involved in a car accident in the Fort Worth area due to the negligent or imprudent actions of another motorist. If that’s the case, then you need the help of an experienced Ft. Worth car accident attorney who understands Texas traffic laws and how to determine and prove who was at fault. Having great legal representation is one of the best steps you can take following an accident in order to ensure you aren’t held liable for something that wasn’t your fault, and that you are able to receive the compensation you need and deserve after a car wreck. For your free, no obligation legal consultation, please call the auto accident lawyers of Fears Nachawati at (866) 705-7584 to schedule your visit to our Fort Worth office on Main Street.